Macanudo 1968 has a new, unprecedented and intense flavour that does complete justice to the full-flavoured tobaccos. Matured in tercios (bales wrapped in palm bark) and in wooden barrels charred on the inside for a more enhanced fragrance, the Dominican and Nicaraguan tobacco unite, combining to become a very characteristic filler, exclusively grown for General Cigar on the island of Ometepe in Nicaragua. These tobaccos for the filler have been carefully developed to complement the Habano Connecticut binder and the unparalleled Honduran San Agustin wrapper. 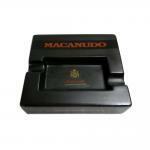 Macanudo 1968 is an expression of depth and complexity that will certainly delight the experienced cigar smoker. 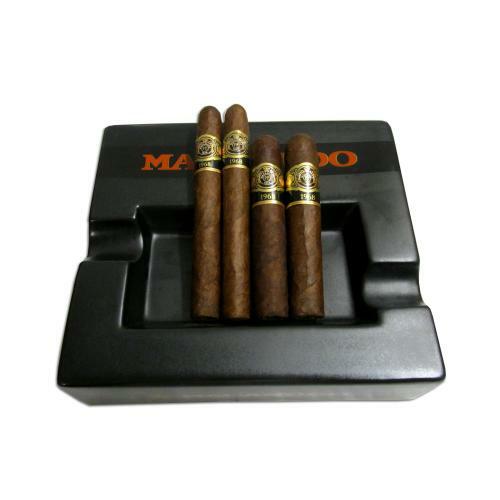 The 4 cigars are packaged in a beautiful Inspirado 1968 cigar ashtray by Macanudo, with 2 rests this unique ashtray will make a statement on any coffee table!